Motivation is definitely required to choose exercising over channel surfing. Although there are a million reasons to stay on the couch, especially when my fat inner lawyer is arguing the point. Food is comforting where working out hurts. The emotions that block staying lean and fit are often deeply rooted obstacles. Losing weight started with a decision when my health was failing, but keeping it off has required new motivation and I found it in an unexpected way, thanks to a friend. A beautiful inner glow is never enough. Hair, nails, skin, weight, clothes, cars, relationships, finances and not being an early riser are continually judged by family, friends, neighbors and our own negative thoughts. No one is immune. Our hearts ache until we reach for solace, often in self-destructive ways. Addictive behavior strikes me as a cry for help. While there are reasons for food abuse, imperative, mind numbing, emotion blocking over-eating is not the best diet. Consuming is far easier than negotiating emotional hurdles. People say the meanest things, but the genuine mistake is taking their crappy words to heart. “You would be great if…” Don’t those ‘ifs’ just mess you up? My understanding of addiction is not being able to stop doing something that you want to stop, a compulsion that is out of control, often followed by feelings of remorse. Something in our makeup, unconscious or emotional background takes over and good intentions stand the same chance as winning the lottery. There are not enough cocoa beans in Christendom to satisfy the black hole of loneliness, desperation of debt or grief from loss. Hiring a personal trainer worked to reduce my weight 55 pounds and I hoped to be able to motivate myself when I reached my goal, but the weight started creeping on again. 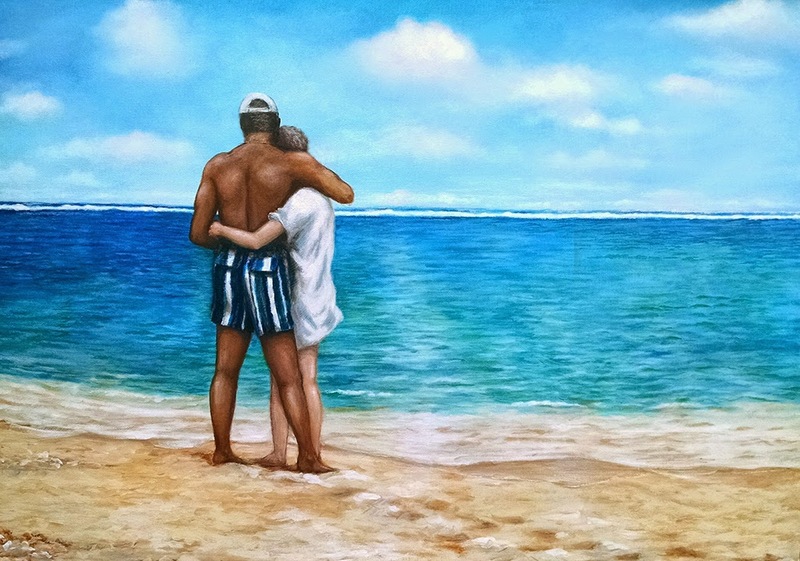 Recently my friend Bill commissioned a painting of himself and his wife. Sadly Dottie passed away a year ago and she is sorely missed. The image is a fond remembrance of a moment they shared. She often wore his shirts at the beach to hide from the tropical sun, nearly disappearing in them. Dottie championed healthy choices with kindness, sincerity and compassion. Her words of wisdom helped me quit smoking. As I worked on the painting conversations with Dottie played in my mind. She was the most naturally moderate person I’ve known, but then I never asked if she struggled to make sensible decisions because she never complained. Remarkably over the last few weeks I’ve found myself back at the gym and no longer buying comfort food. Remembering Dottie's kind words and concern, where I often have not found them for myself, has been the gift of doing this painting. It takes someone who is not an addict to elevate one. It takes love.